Our unplanned Osamu Tezuka January jag continues! Let's take a look at some offbeat merchandise from Tezuka-inspired anime series; particularly JUNGLE EMPEROR, which you know as KIMBA THE WHITE LION unless you know it as LEO THE LION. Which isn't actually the same show, but a sequel. The 1965 KIMBA series was the first color cartoon made expressly for Japanese television, and served as the inspiration for many tributes, imitations, and products, including this lovely Leo light. No, seriously, that's what it was marketed as, the "Lovely Leo Light". At some point in the mid 1980s my brother went out to L.A. He picked this lamp up at the fabled "Pony Toy-Go-Round". And yes, it still works! And if reading by the light of the Lovely Leo Light makes you hungry for candy, you can always have some Jungle Emperor Ju-C-Double candy, delivered right from Leo's neck. I picked this up at a now-defunct Japanese grocery store in Doraville GA and yes, I ate all the candy. As an imitation Pez, the Ju-C delivery system sports softer plastic construction and a less robust candy-feed mechanism than its European counterpart. However, it features the angry head of Leo, in the face of which all objections vanish. When you're done with the candy, Leo's head can be mounted trophy-style atop your favorite pencil at school. Remember moms, this candy is approved by Osamu Tezuka himself - and he's a doctor! Once your Tezuka themed shopping expedition is complete, your purchases will fit neatly inside your Astro Boy plastic bag. This one was picked up in the mid 80s at the Philadelphia retailer "Heaven", which featured a full line of Astro Boy T-shirts and Space Giants and Godzilla monster toys, alongside thousands of magnets, toy robots, and other wonderful kitschy goodness. A more aptly-named retail establishment would be hard to find. Note: a version of this review originally appeared in 2002 on the website Anime Jump. METROPOLIS is an animated version of a manga by Osamu Tezuka, with a script by Katsuhiro Otomo, directed by Rintaro. If those names don’t mean much to you, then this review won’t either. Oh, sure, you’ll enjoy this movie- which is a visually stunning, brilliantly directed animation spectacular with an engaging storyline, strong characterization, and refreshingly retro character design - you just won’t enjoy it as much as I did. Back in the 1930s, Japanese manga pioneer Osamu Tezuka saw some stills from the 1926 Fritz Lang film METROPOLIS. Inspired (as so many were) by the haunting images of the gigantic city and the struggle of its inhabitants, Tezuka wrote his own story around Lang’s film and in the first flush of his success as a manga author, published his own METROPOLIS, which, along with LOST WORLD and NEXT WORLD, made up his original science fiction trilogy. Set against the background of the fantastic techno-wonderland Metropolis, this film portrays the power struggles between the city-state’s various factions. Not only is the city’s disgruntled underclass about to revolt - obviously they’ve seen the silent film - but the city’s mysterious millionaire Duke Red is plotting against the government. Duke Red’s own Marduk political faction is constantly at war with the intelligent but subservient robots. Marduk’s commander, Duke’s adopted son Rock, struggles for his father’s attention, but is ignored in favor of Duke’s scientific fantasy, the center of which is the immensely powerful, lifelike girl-robot Tima. In the midst of this three-and-four way struggle, Shunsaku Ban and his nephew Kenichi arrive. Ban is a detective on the trail of the missing scientist Dr. Lawton. Is Lawton involved in Duke Red’s mysterious plan? Can they get to the bottom of the mystery, even as Metropolis crumbles around them? I know this is a cliché bored reviewers trot out for every new anime film, but I’ll say it again. METROPOLIS is visually stunning. Rintaro’s direction has never been stronger, and I say that as someone who owns four different versions of his GALAXY EXPRESS film and who watched all of DAGGER OF KAMUI without subtitles, twice. All his hallmarks are there- dramatic rays of light penetrating the darkness, gigantic buildings delicately shaded and colored, choreographed slo-mo scenes of vast destruction. 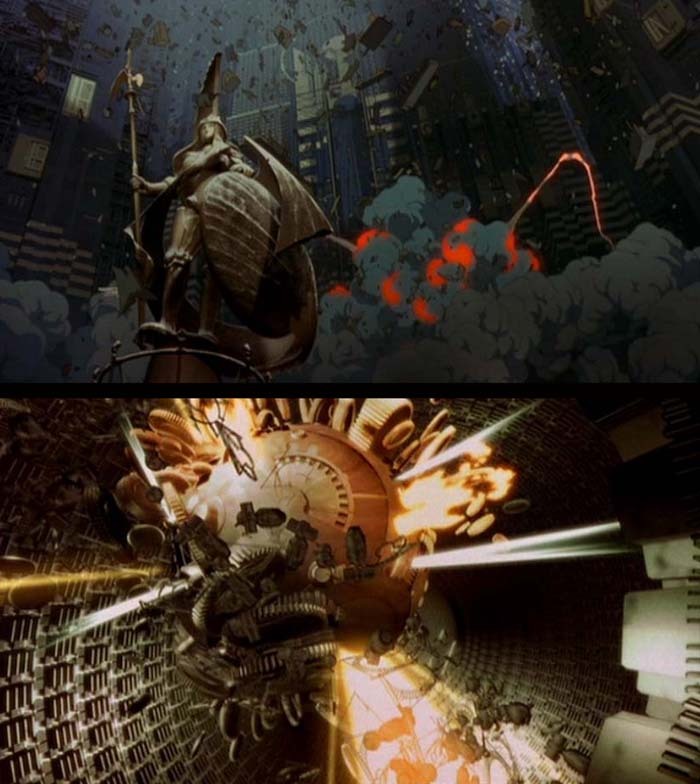 At times he’s even taking cues from himself - the whimsical robots he pioneered in ROBOT CARNIVAL are back, and there is one scene lifted wholesale from BATTLE ANGEL ALITA. Rintaro’s well-animated (by ace studio MADHOUSE) characters inhabit a fully-realized world that we see from every angle, from the top of Duke Red’s menacing Ziggurat to the lowest of Metropolis’ deepest levels. Sometimes all in the same shot. 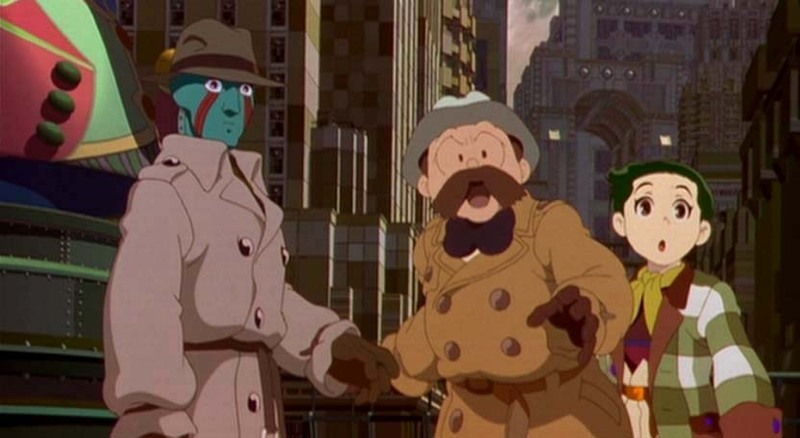 Since this is a Katsuhiro Otomo version of an Osamu Tezuka story based on the Fritz Lang movie, one has to look for Otomo’s hand in the script, and it’s definitely there - political corruption, personal betrayal, technology that goes too far and assumes a life of its own. The struggle between the natural and the artificial is not a new theme for Japanese animation, but I know of no other film that lays the battle lines out so clearly, and demolishes them so utterly. I was particularly impressed to learn that many story elements were added to the original by Otomo - his storylines are seamlessly integrated and really have that Tezuka atmosphere. The score is an unexpected pleasure. METROPOLIS has a wonderful jazz soundtrack that contrasts brilliantly with all the high-tech scenery. Instead of the typical bombastic orchestra, or heaven forbid, the dreaded all-electronic soundtrack, the lively, fun METROPOLIS score ranges from bebop to Dixieland and keeps the film’s humanity in the foreground. These aren’t old classics dug out of the public domain vault, either; apart from one very prominent Ray Charles tune, this is original work by Toshiyuki Honda, and that’s Rintaro on sax, can you dig it? 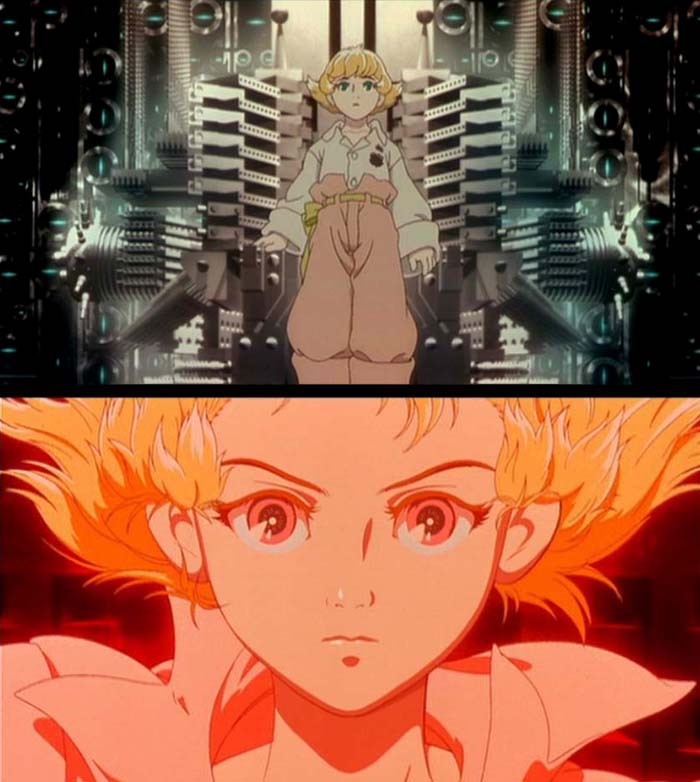 To be certain, the long-time anime fan will get a kick out of this film However, that’s not to say METROPOLIS won’t be entertaining for the general public, especially now that the general public has been acclimated to the idea of Japanese animation being potential art-house material. 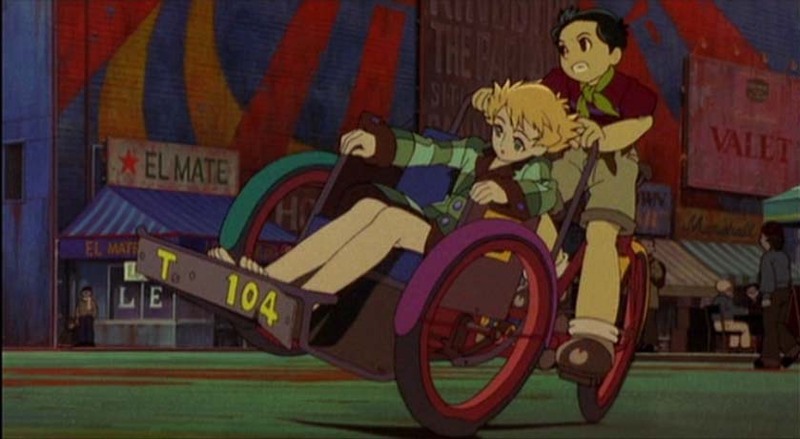 This film has all the techno-spectacle of AKIRA, but instead of that movie’s bleak tone and no-future worldview, METROPOLIS has old-fashioned scientific romance appeal. I don’t think it’s too far off to characterize this film as a big, sloppy love letter from Rintaro to the memory of Osamu Tezuka. All of Tezuka’s classic stock characters make an appearance and the homages and references are constant. 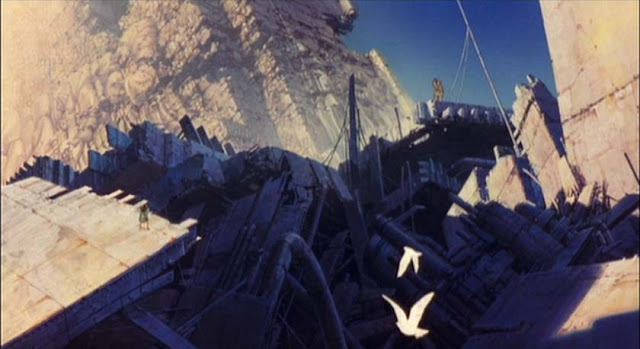 Much is made of the computer animation in this film, and while there’s a real attempt to keep it in line with the traditional animation, it is still too smooth, too shiny, and too controlled. The gulf between paint and pixel is still too wide, and the film’s attempt to bridge the gap is earnest but unsuccessful. Still, as Rintaro points out, Tezuka himself was always trying new things and new techniques. Both his commercial productions and his experimental works were rife with well-meant attempts at expanding the medium. 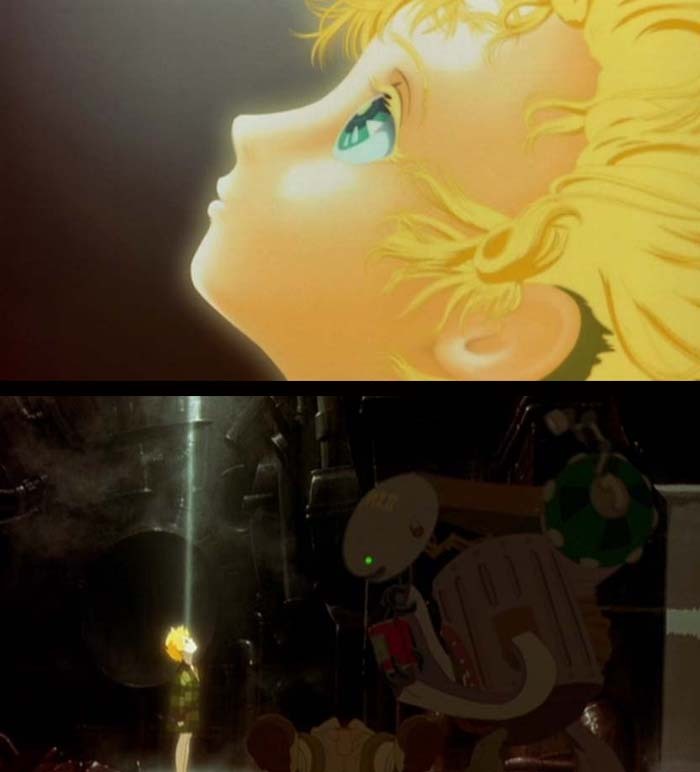 If anything, a pure Tezuka version of METROPOLIS might have had even more CG, perhaps less of the juxtaposition of old and new, less of the struggle between gleaming future machine and old school cartoon that gives this METROPOLIS its power. The readily available, early 2000’s edition DVD is just as classy as the film. Columbia-TriStar produced a comprehensive gatefold package, with the film in English, Japanese, and French, subtitled in two different English versions as well as French, Spanish, Portugese, Chinese, Korean, and Thai, and of course it’s widescreen. The extra materials? You get character sketches and a step-by-step visual guide to the special effects and CG animation. A 20 minute special details the original comic and features interviews with Rintaro, Otomo, the major voice talent, the animation studio Madhouse, and the composer Toshiyuki Honda. There are additional interviews with Rintaro and Otomo, there’s a Rintaro filmography and a short bio of Tezuka’s career. Seeing Otomo and Rintaro both agree that Tezuka wouldn’t have let them make this film while he was alive, or watching Taro explain his efforts to drag digital animation into the analog world; it’s gold. Lacking is a primer on the Tezuka references - there can’t be too many Americans versed in Tezuka’s visual motifs. Perfect for the Blu-Ray, fellas! Not to diminish Tezuka’s legacy, but he was known as kind of a control freak. I have doubts he would have let Otomo and Rintaro have their way with METROPOLIS if he’d been alive, and that would have definitely resulted in a stodgier, less interesting film. 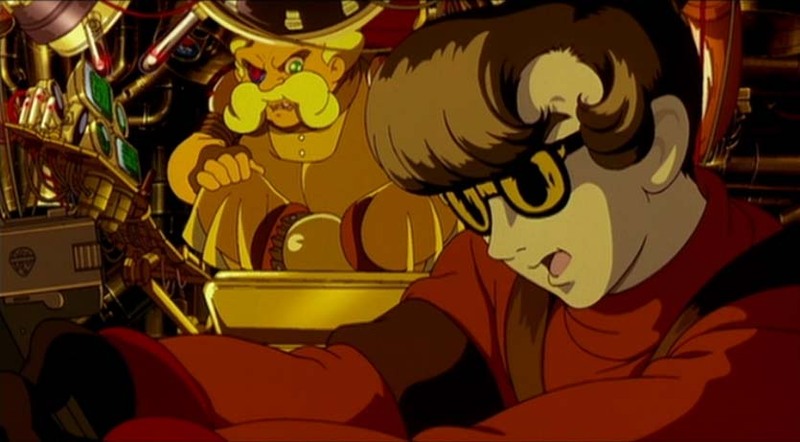 What counts is the end result, and the end result of METROPOLIS is a fantastic, engaging film that shows the best of Tezuka’s story, Otomo’s screenwriting, and Rintaro’s direction. It’s rare for a film project to live up to its hype. It’s rarer still for a film to exceed all expectations. METROPOLIS, for me at least, is that film. METROPOLIS screens Thursday January 6 and Sunday January 9 at the Toronto Underground Cinema. Custom hand-painted Russian nesting dolls sporting your favorite Osamu Tezuka characters? Yeah, that's pretty cool. Painted by "hooverdam", whose handmade MLS banners have been seen in major league soccer events around the world.